Trying to beat the heat on a Friday afternoon. The home run though was Larb Moo. Larb Moo is ground pork with shallots, mint, scallions, cilantro, chili powder and lime dressing. It was light and invigorating. On the 1-5 heat scale I asked for a 3 and it was perfect. Spicy enough to get me sweating without killing my taste buds. A great dish for a hot day. This is one of the best versions of Larb I have eaten and it is worth a trip to Zabb Elee for the Larb Moo alone. I will be back. I rolled out of Zabb Elee feeling a little stronger. I started heading uptown when a thought occurred to me. I had been downing iced coffees, soda, water, lemonades, whatever I could get my hands on to keep me going in the heat. Then I remembered the ultimate pick me up. I crossed 1st Ave and made a right on 7th Street. I hopped up a few steps and entered the Van Leeuwen Artisan Ice Cream Shop. The light yellow Van Leeuwen Ice Cream trucks were one of the first break outs in NYC's food truck craze. They brought artisan ice cream to the mean streets of NYC, offering an alternative to Mr Softee. The success of the trucks has led to three brick and mortar spots, including my stop on East 7th Street. So what was it that drew me to Van Luuewen? That most wonderful of Italian creations, affogato. The Italian version of a root beer float. Affogato is vanilla gelato with espresso poured over it. Van Leeuwen amps it up, American style, with a generous two scoops of their Vanilla Ice Cream and a generous pour of espresso. Hot and cold, caffeine and sugar, bitter and sweet, this is my ultimate pick me up. Keep your Red Bull. I will take an affogato every time. For the past few summers I have ended up with a free Saturday. No kids, no responsibilities. And my ritual has been simple. See a movie, sit at the bar at The Redhead. The Redhead is a great little spot on East 13th Street serving Southern food with a heavy dose of New Orleans. It is one of my favorite spots and I have sampled most of the menu. But when I go and sit at the bar on a summer Saturday night I am there for two things. Fried Chicken and a side of watermelon. 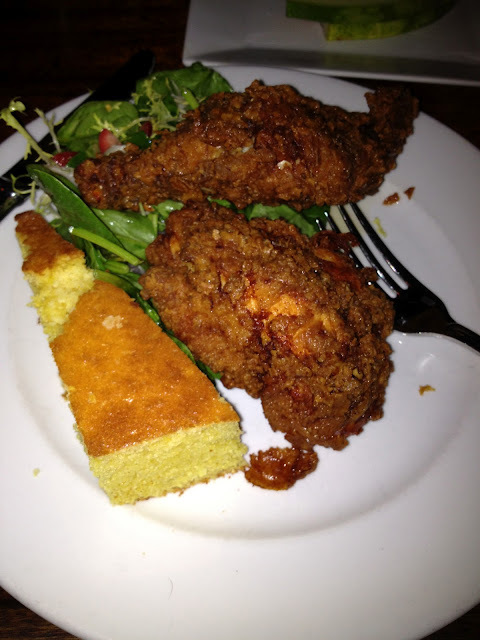 The fried chicken at The Redhead is one of the best in the city (and we now have a lot of great fried chicken here). The picture does not do it justice. The skin is top notch. Extremely crispy without being dry and full of flavor. The meat is plump and juicy. It is must for any fried chicken fan. And the sides it comes with put it over the top for me. A big wedge of delicious cornbread and a salad of spinach, strawberries and candied almonds. It has made me strongly reconsider the usual mashed potatoes and greens. With a Sazerac or Abita in hand, I am in heaven sitting at The Redhead's bar. But there is one other dish that has drawn me here. It is a simple thing, but I wait for it all winter. A side of watermelon. Wedges of watermelon sprinkled with chili salt and lime juice. Simple. Amazing. Sweet, sour, salty, spicy and completely refreshing. Please, try this at home. If you like bacon peanut brittle, shrimp with low country grits and sausage or Caesar Salad, The Redhead is for you. If you like fried chicken and ramped up watermelon, welcome home. OK, I'll admit it. It is pretty good. For years my friends from Connecticut have claimed that New Haven has the best pizza. We all know that isn't true, but they need something to hang their hat on. 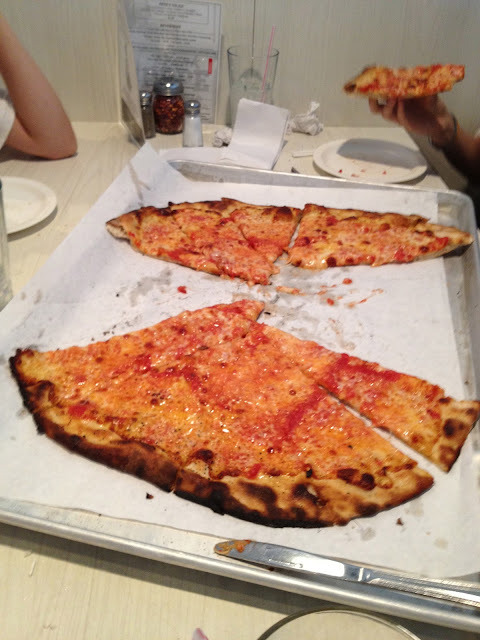 With the pizza revolution going on in NYC, that claim is sillier than ever. But after years of hearing raves I finally made it to Frank Pepe's Pizza. I did not go to Frank Pepe's in New Haven. At this point it is a tourist trap like Lombardi's. The pizza may be good but you have to suffer long waits with the masses. No thanks. No, I went to Frank Pepe's branch on an industrial street off the highway in Fairfield. We rolled in for lunch with a group of seven and had no problem getting a seat. So, the pizza. We ordered three different pies. The first was the original tomato pie with mozzarella. It was fine. Good thin crust pizza. Nothing to go insane over but solid. The second pizza was a white spinach, mushroom and gorgonzola pie. Now we were getting somewhere. Good, chewy crust, with the gorgonzola mixing with the mozzarella to make it savory but not too rich. The mushrooms and spinach add the right funky and bitter notes. Nice one. Finally, we had the white clam pizza. Fresh clams, grated cheese, olive oil, fresh garlic and oregano. This is a pizza to brag about. 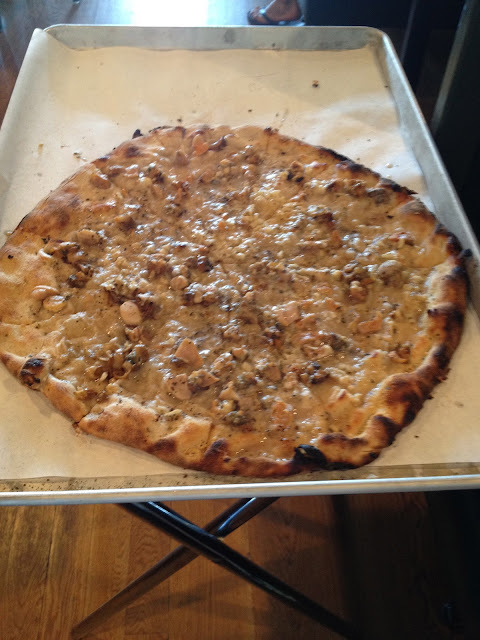 This is as good a clam pie as you will get. Big, plentiful chunks of chewy clams are generously bathed in olive oil and a lot of garlic. Imagine great linguini and white clam sauce with a nice thin pizza crust standing in for the linguini. Outstanding. The next time I am stuck in bad traffic on 95, outside of Fairfield, I won't get mad. I will just pull off the highway for a quick pit stop with a smile on my face. Pepe's white clam pie awaits. My mouth is watering - got to get back to Redhead and also grab one of those Affogatos nearby. FYI, we have hit the Pepe's in Yonkers a few times as Jill has been a Pepe's fan for years and was thrilled when this spot opened. Are you searching for a reliable and trustful essay writing service? have a peek here and you will find it!